I just got back from a visit to my sister’s farm outside Madison, Wisconsin. It is on a beautiful piece of land quite near New Glarus, the home of one of the most lauded craft breweries, New Glarus Brewing Company. A few years back New Glarus built a new facility just down the road from their old one. There they now have the proper capacity to brew their flagship Spotted Cow in appropriate quantities. They still have the old place operating, producing their oft-awarded fruit beers (that they age in giant wooden barrels) as well as a number of Dan Carey’s strange and unique creations. Tonight I will have some of the strangest of those beers, ones that push the limits of craft brewing. The first rating I have is a beer available, only occasionally, on tap in the tasting room at the brewery, the Golden Ale. Despite its bland name, this beer is anything but. It pours a hazy golden color with some creamy white head. The nose is dry and dusty. Some noble hops come through, and a bit of berries as well. The flavor is immediately bitter and dry. Earthy hops and some dust and hot funk (possibly from Brettanomyces wild yeast?) make themselves known next. The Golden Ale is well carbonated and lively, but there remains a bit of thickness on the palate. 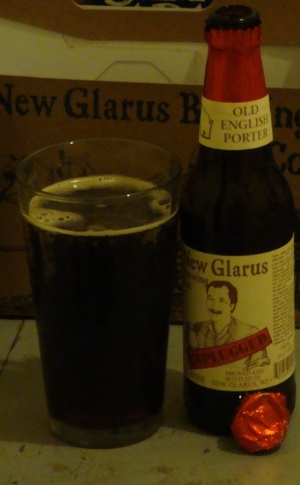 Tonight the first beer I will try is the Old English Porter. 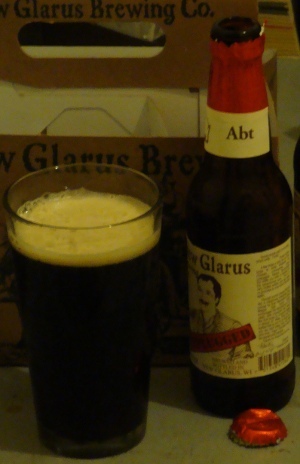 On the label they are careful to point out that porter is a style that used to be made sour, and thus the New Glarus Old English Porter is also sour. I would add that EVERY beer used to be made sour, but that’s neither here nor there. The Old English Porter is lightly carbonated (also traditional), so it pours almost no head. What there is has a straw-color, above a lightly hazy, deep mahogany colored beer. The nose gives away the sour immediately. It is reminiscent of the aroma of a Flanders brown ale, not surprisingly. That characteristic balsamic vinegar is accompanied by dark malt notes. Some nuts and toast and just a little bit of caramel. The flavor is remarkable. An English porter is certainly part of it, with the rich dark maltiness. Caramel and toast are accompanied by raisins and dates. The sourness brings a whole other dimension to it, with the attendant balsamic vinegar and raspberries. Some noble hops make themselves known as well. The palate is a bit thick, but the sourness and a light bitterness balance it out. The next beer I will try today is the Abt, brewed in the style of a Belgian quad. The Abt pours a hazelnut brown with a bit of off-white head. The nose is much too subtle. Some dark malt flavors come through, but not nearly enough, and there is almost no spiciness and alcohol, two important characters for this style. The flavor, on the other hand, is right on the money. The spice is prominent, and rich malty sweetness is evident. The dark Belgian candi sugar lends its unique character. The only thing I would ask for is a bit more of an alcohol warming or bite, but with the Abt around a mere eight percent, that would only indicate a fault. The body is rich and full, but refrains from getting too thick. I’m not so sure how I feel about the label on the Gueuze and its kin. This series of beers, available only at the brewery, have labels that, at first glance, appear to be handwritten, yet turn out to be printed. I really don’t like deception, so while I appreciate the effort to make it known that this beer is only a single batch, I detest the facade of it all. Anyway, this is a beer blog, not a label blog. For that you’d have to go over to somewhere like the Maverick Label Blog. But I digress. Let me start by saying simply that Dan Carey’s gueuze is on par with any from Belgium. The Gueuze pours a pale straw color, ever so lightly hazy, with a pillow of creamy head that is just barely off-white. The aroma is full of funk, dust, berries, cherries, and cheese. It tickles your nose. It is serious but not too strong, staying just delicate enough to make you stick your face right in the beer. The flavor is strongly acidic but not too much so. Despite the lack of any actual fruit addition, there is a serious raspberry character. The barnyard funk is somewhat less than many Belgians, but still present. Dust is one of my favorite aspects of lambic beer, so I don’t know if this gueuze is lacking dust or if it is just me, but it’s certainly hiding behind other flavors. There is a bit of malty sweetness balancing the acid, especially as the taste evolves. Finally it all almost disappears after a few moments, begging for another sip. This may not be the best real gueuze around, but it is certainly the most drinkable, despite the initial acidity. Finally I will try a beer called Enigma. 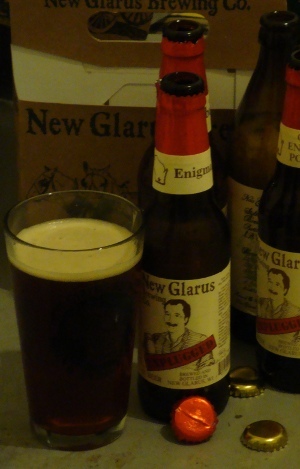 It has been years since New Glarus released this beer, but I will readily admit that in the summer of 2007 I would have called this beer one of my favorites, ever. I will try my hardest to rate it impartially today, but to be honest, I don’t know if I will be too easy or too hard on it simply for that reason. Enigma pours a reddish tawny color with some creamy off-white head. The nose is intriguing. Some of the balsamic and raspberry character of a Flemish red, a strong maltiness, and even a bit of smoke. On the back end are prunes and some spices, cinnamon and clove. The flavor is likewise unique. I can’t tell which comes out first, the tart cherries, the spicy cinnamon, or the sweet caramel. All three are strong, independent flavors, yet they meld into a concoction that is reminiscent of mulled wine, or even, perhaps, glühkriek. Yet the enigma (I’m sorry) doesn’t end there. The alcohol adds a strong warming sensation, the yeast yet more balsamic vinegar, and there is an exotic spiciness that I cannot name. Sweet, sour, spicy, alcoholic, and even a little bitter. The palate is full but not thick, sweet but not cloying, and active but not overpowering. This beer is contemplative and complicated, yet entirely pleasant to drink. I try to refrain from awarding a perfect score in any category, but especially for flavor or aroma. As far as I know I’ve only done it a few times before, for the aroma of Cantillon’s Iris, the flavor of BFM’s Abbaye de Saint Bon-Chien and Westvleteren’s 8, and both of them on that 1979 bottle of Liefmans Goudenband. But I have no qualms at all giving the Enigma a perfect score for flavor. I cannot imagine how the taste of this beer could possibly be improved. This entry was posted on Monday, November 15th, 2010 at 0:53	and is filed under Uncategorized. You can follow any responses to this entry through the RSS 2.0 feed. You can leave a response, or trackback from your own site. This is good news for a girl who will be back in Wisco. for Christmas. Not to mention a new Gueuze (that is not fair to spell) and some Belgium knock offs. I might pass on the golden ale though, unless I am feeling adventurous at Jim’s. Apparently I am Erub now. Good going, early morning typing self. 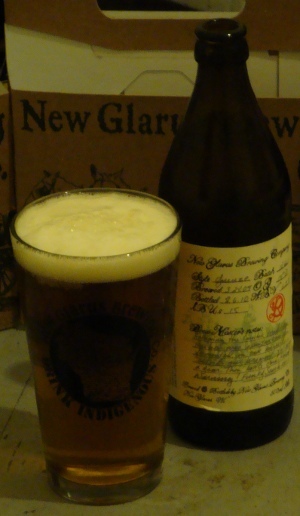 My friend is bringing us some New Glarus beers tonight– I dug up this post for him to shop from. Super excited to try the Enigma. Enjoy. If you’re feeling adventurous and he brings both mix a bit half Enigma half Gueuze.